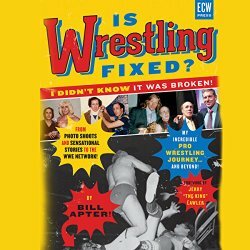 Review Fix chats with Professional Wrestling Journalism Legend Bill Apter, who discusses the audiobook version of his book, “IS WRESTLING FIXED? : I DIDN’T KNOW IT WAS BROKEN!” from Audible Studios this August. Breaking down his inspiration to do the narration and the decision to do an audiobook, as well as his hopes for the book, Apter gives us an inside look at the passion that has fueled a half-century in the Sports Entertainment business.